The Civil Democratic Movement (CDM), a coalition of liberal and leftist political parties and organisations, announced in a statement on Tuesday its decision to boycott the Egyptian presidential elections in March, citing what its described as ''the lack of any positive signs from the regime to guarantee a free and fair electoral process." The CDM, which was founded in December 2017, claimed that the state used forced engineering of the presidential elections to eliminate the possibilities of any serious challenges to President Abdel-Fattah El-Sisi, citing difficulties and obstacle faced by a number of potential candidates to run in the contest. The CDM includes the liberal Dostour, Egyptian Social Democratic, and Reform parties, as well as the Development Party, the Socialist Popular Alliance Party, the Nasserist Karama Current and the leftist under-construction Bread and Freedom Party. In the past few weeks, a number of potential candidates, including rights lawyer and founder of the Bread and Freedom Party Khaled Ali, ended their bid to run in the presidential elections for various reasons. Last week, Ali quit the race before completing the collection of the 25,000 citizens' endorsements required to apply for candidacy, citing what he claimed to be an unfair electoral field. 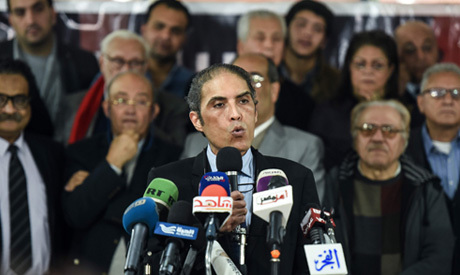 At a press conference held by the CDM leaders at the Karama Party headquarters in Cairo, Hamdeen Sabahi, the Nasserist politician and former 2104 presidential candidate, questioned the current electoral process. "These are not elections; there are no guarantees, no candidates, and no freedoms; there can be no elections without candidates and without guarantees," Sabah said. The movement called on the public to join it in rejecting this process in form and content, adding that it plans to reach out to other "democratic and patriotic forces" to build a "modern democratic state based on the peaceful transfer of power." The Egyptian government, however, has rejected claims by some potential candidates that it was biased against their campaigns, saying it stands at an equal distance from all potential candidates. Last week, the National Elections Authority (NEA), the independent judicial body which regulates the electoral process, rejected the allegations made by Ali that his supporters faced bureaucratic hurdles in collecting or filing the required citizens' endorsements. The NEA said in a statement that Ali's claims were unfounded and could not be substantiated. Last week, President Abdel-Fattah El-Sisi submitted 173,000 citizens' endorsements to the NEA, completing the candidacy requirements. On Monday, Moussa Mostafa Moussa, the chairperson of the Ghad Party submitted 47,000 citizens' endorsements to the NEA, becoming the second potential candidate to complete the requirements. The NEA deadline to receive requests to run in Egypt's 2018 presidential elections expired on Monday at 2pm, leaving President El-Sisi and Moussa in a possible head-to-head race if deemed qualified as candidates by the NEA. The elections are set to take place on 26-28 March in Egypt, with expats voting at Egyptian embassies and consulates around the world from 16 to 18 March. Most Egyptian political parties and coalitions have called on the public to turn out in large numbers to vote in the March elections in order to strengthen the democratic process. The forces mobilising the public to vote include the liberal Wafd Party, the liberal Free Egyptians Party, and the Salafist Nour Party, three parties which have dozens of members in parliament.